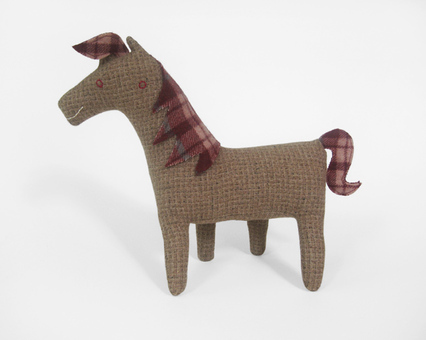 Horse no.58 has a sweet tan houndstooth with a brick red, cream and blue mane and tail. It's quirky face is hand embroidered with red eyes and a toothy white smile. Horse no.58's legs are uniquely positioned so that you can see all four legs at once. It is made out of high quality, woven wool that I've felted, and is stuffed with eco-friendly fiberfill. Measures approximately 11 inches wide (28cm) and 10.5 inches tall (27cm). Unicorns and Horses are mailed First-Class through the United States Postal Service. Please let me know if you would liked them shipped differently.